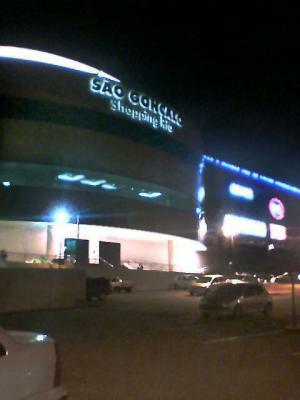 That's the shopping mall of Sao GonÃ§alo, RJ, where I live. I haven't planned to take a picture of it, but when I was coming back to the car in the parking lot I thought that the neon lights would give a good picture. I had to try my best with my cell phone (this cell phone with camera is making me take pictures like mad!) and with Photoshop: the original picture had a lot of noise and blown highlights. P.S. : The first shot I took was blurred. So, I tried it again, without breathing and holding the phone very steady. Joao has neatly demonstrated here two important concepts in digital photography – first, take a camera with you (won’t get any photos without one! ), and second, if the first shot isn’t quite what you wanted, take another. Night time photography is one of those areas of photography that can yield some stunning results. Here we have the nice bright neon lights set against a dark sky. There’s even a hint of a starburst from one of the street lamps. But somehow, it’s missing that something that turns an ‘ok’ shot into a great shot! So what are those missing elements? First, there’s the static nature of the scene. Night time photography looks good when there is a little movement in the scene. You have probably seen those night time photos where the car head and tail lights become streaks of red and white – it adds impact, unfortunately missing from this photo. Then there is the sharpness of the photo. The background is a little blurry and it detracts from the scene. Now, I appreciate that all Joao had at the time was a camera phone, so sharpness will always be difficult. It would also be impossible to capture those car light trails. Well done for having a crack at night time photography, and thanks for the submission. There’s a link below to some night time photography techniques that could help for your next foray into the dark!